← 345 "There's Something About Marrying"
"This is every effigist's worst nightmare!" Beer in a milk carton is not milk. "On a Clear Day I Can't See My Sister" is the eleventh episode of season 16. It originally aired on March 6, 2005. Guest star Gary Busey appears as himself and Jane Kaczmarek returns as Judge Constance Harm. "Lisa becomes fed up with Bart's teasing and takes out a restraining order against him, while Homer takes a job as a Sprawl-Mart greeter." The students of Springfield Elementary School take a field trip to the Springfield Glacier at 3:00am. Unfortunately, the glacier has melted almost completely away, and Lisa blames the melt on global warming. She tries to raise the other students' consciousnesses about global warning, but they ignore her and a ranger tries to shut her up. Bart, for his part, plays a practical joke on her as she desperately asks the students to save the glacier. Lisa's pleas go unheard, however, as the students are instead laughing hysterically at Bart's prank (which involves sending farting noises over a walkie-talkie while Lisa tries to talk). Meanwhile, Homer and Marge go shopping at the Sprawl-Mart and find Grampa working there as a greeter. Grampa gets hurt, loses his people-greeting abilities and asks Homer to take over for him as the people greeter. Homer proves to be a success as a people greeter, prompting the manager to offer Homer a full-time position without any chance of advancement. Homer is pleased with the offer, due to the low expectations, and takes the job. The next day, Lisa is still angry with Bart and takes out a restraining order against him. Under the order, according to Chief Wiggum, Bart must remain twenty feet away from Lisa at all times, or he will face more legal consequences. Wiggum shows the family a Gary Busey-hosted videotape, Get Out of My Dreams and Also Out of My Car: A Guide to Your Restraining Order, which teaches Bart how to live with a restraining order. 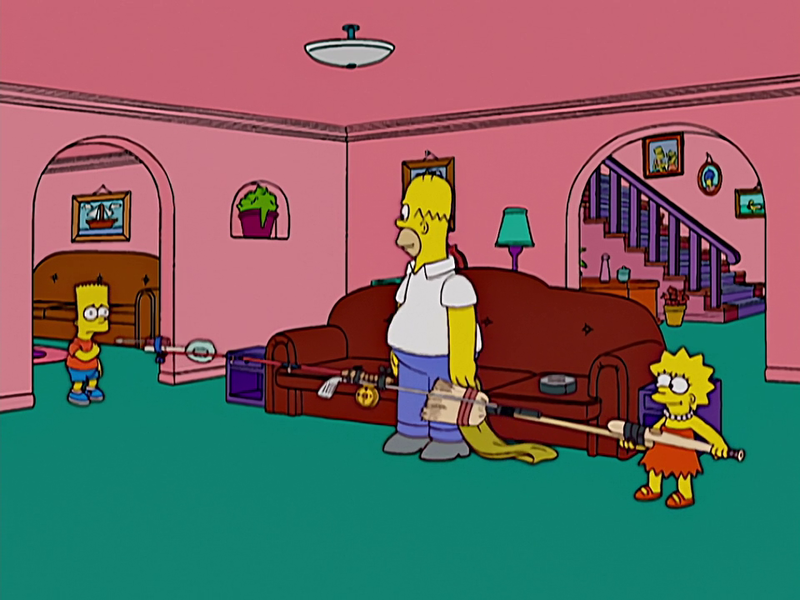 To make the restraining order more fun, Homer makes a 20-foot pole that can be used to warn Bart when he's less than 20 feet from Lisa and needs to move away. Lisa, however, starts abusing the power of the restraining order and follows him wherever he goes (which in real life would be grounds for having the order removed). At school, the order means that Bart can't even enter the school and he is forced to sit outside in the rain. Marge appeals in Family Court (with Judge Constance Harm hearing the case) to get the restraining order removed. Bart testifies that Lisa has no sense of humor and in the process manages to insult the judge. Furious, Judge Harm increases the restraining order to 200 feet (61 meters to the Europeans in the back of the courtroom). Bart can now only live at the edge of the Simpson family property. Now living in a tent at the edge of the property, Bart takes a look at nature and embraces it. He begins peeing outdoors (instead of running to the house to use the toilet) and running with a pack of wild dogs. Meanwhile, at Sprawl-Mart, Homer finds out he's not so much a worker as he is a slave. He is forced to work all night and day without being paid, and he cannot leave the store because the management had a v-chip implanted in his head that will shock him painfully if he leaves. He lobbies his fellow associates at Sprawl-Mart to shut the store down, but they insist that they have learned to accept the things they cannot change and steal whatever is not nailed down, Homer eventually leaves the store on his own, driving through the front door in a fork lift loaded with several plasma TVs. Back in the Simpson backyard, Bart builds a giant statue of Lisa using wicker. She actually likes it so much, she forgives him and breaks the 20-foot "poking pole" in half. Just then, Dolph, Jimbo and Kearney show up carrying lit torches and announcing that they're ready to torch the "Wicker Witch of the West". Lisa is at first angry that Bart built the statue just to burn it (essentially, to burn Lisa in effigy), but she decides to forgive him anyway. The boys set fire to the statue, and as it burns, Lisa throws the restraining order and the broken poking pole into the fire. As the closing credits start to roll, the statue keeps burning while the Simpsons play (and dance to) the Herb Alpert tune "Tijuana Taxi". Modified on September 10, 2015, at 16:49.